Meigs County Juvenile and Probate Judge Scott Powell was recognized on Thursday by the Ohio School Boards Association. Pictured are (left to right) Richard Lewis, OSBA Executive Director; Cathye Fory, State Board of Education member; Larry Tucker, Meigs Local Board of Education President; Judge Scott Powell; Stephanie Dodd, State Board of Education member; and Michael Fador, OSBA Southeast Region President. 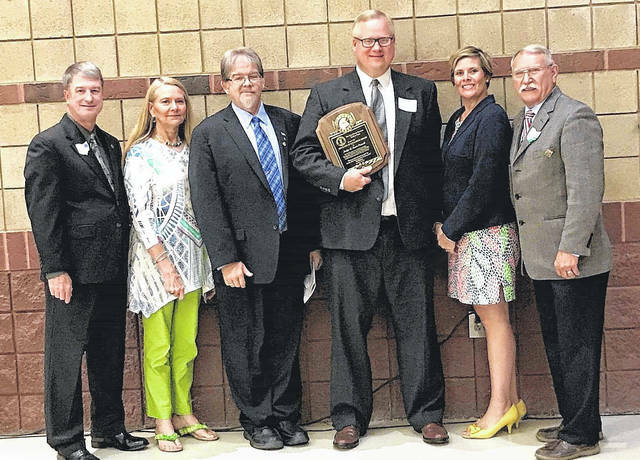 ALBANY — Meigs County Juvenile and Probate Judge C. Scott Powell was presented with the Advocate of Education Hall of Fame Award at the Ohio School Boards Association’s Southeast Region Fall Conference held Thursday at Alexander Local. The Advocate of Education Hall of Fame Award is the highest level recognition in the association’s Southeast Region and is presented annually to an individual, business or corporation that has gone above and beyond in advocating for children and public education in the region and across the state. Powell, a graduate of the Meigs High School Class of 1987, received his Bachelor’s in Business Administration from Ohio University in 1991 and his Juris Doctor from the University of Detroit School of Law in 1994. After beginning his career as a private attorney, Powell became Meigs County Assistant Prosecuting Attorney and the first Magistrate in Meigs County at the Village of Pomeroy. Since 2003, he has served as the Meigs County Juvenile/Probate Judge. As Judge, he has taken a proactive approach in each Meigs County school district by working with administrators, parents and students to improve school attendance through an informal hearing program. Under his leadership, Meigs County became the first Juvenile Court in southeast Ohio to become an eligible Title IV-E court equating to substantial federal dollars for juvenile services. In 2011, Judge Powell assisted in coordinating and emceed the “Meigs County Above the Influence Summit” — a historical event that for the first time gathered together high school students from Southern, Eastern, and Meigs to encourage them to make positive decisions without the influence of drugs and alcohol. He was awarded the Southeast Ohio IMPACT Person of the Year in 2011 for his efforts in drug prevention and awareness in our region. Powell currently serves on the Board of Directors at Hocking Valley Community Residential Center, a southeast Ohio youth facility serving 14 counties. He is also a member of the local Prayer Task Force and Opiate Task Force that sponsor public awareness and positive youth events throughout Meigs and Mason Counties. In 2016, he was instrumental in getting Meigs High School selected for a visit from the Ohio Supreme Court. They not only visited but held court proceedings that were open to the public as well as Meigs High school students and the other county high schools. Powell has also been a middle school assistant football coach for the past few years. He is a member of the First Baptist Church of Racine, where he serves as a Deacon. He resides in Pomeroy with his wife, Kristi, and daughter, Kelsie. https://www.mydailytribune.com/wp-content/uploads/sites/42/2017/10/web1_10.1-Powell-Award20179291357673.jpgMeigs County Juvenile and Probate Judge Scott Powell was recognized on Thursday by the Ohio School Boards Association. Pictured are (left to right) Richard Lewis, OSBA Executive Director; Cathye Fory, State Board of Education member; Larry Tucker, Meigs Local Board of Education President; Judge Scott Powell; Stephanie Dodd, State Board of Education member; and Michael Fador, OSBA Southeast Region President.